It is a reasonable assumption that there has been a dwelling on this important site, at the centre of the village and at the entrance to the churchyard, from medieval times. It is likely that the priest had his dwelling here. In 1584, a return of all church land was called for by the Bishop, and the Tytherington terrier of glebe includes 'one dwelling house, a barn and one orchard containing half an acre'. The site of Church Cottage is about half an acre and it is a credible hypothesis that this was indeed the site of the priest's modest dwelling. Later, when a new vicarage was built in 1662, to reflect the changing status of the clergy, the old was pulled down and the present three-bedroomed house was built. Some internal details of the building seem to confirm a late 17th century date. At a later date, a somewhat smaller dwelling was added on the east side, with a lower roof line and only two bedrooms. It may have been built from the beginning as a smithy, in a convenient situation in the centre of the village, and was in use as such through most of the 19th century. In the last part of the 17th century and through the 1700's, there was a blacksmith on the edge of the parish at Cutts Gate, on the road traditionally known as the Old Gloucester Road (Bristol - Stapleton - Hambrook - Earthcott - Itchington - Tytherington - Brinkmarsh - Whitfield - Falfield - Gloucester). The main coach route from Bristol to Gloucester went through Thornbury. In 1726-7, however, a turnpike road was built through Grovesend and Milbury Heath (now the A38), which by-passed Thornbury and also, of course, the Old Gloucester Road through Tytherington. Trade at the smithy at Cutts Gate would have suffered considerably, and although Charles Pierce, the third generation of blacksmiths there, was still working in 1769, there is no subsequent record of a smithy at Cutts Gate. 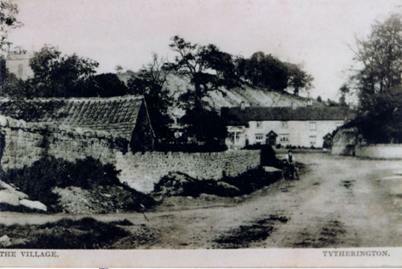 It was perhaps at this time that the smithy at the centre of Tytherington was built, or rebuilt. The Tratman family, from Tortworth, came to the village about 1800; John was followed by his son Robert, and by his grandson Thomas, who were the village blacksmiths for three-quarters of a century. The smithy closed down around 1890, when the quarry was developing with its own smithy up the road, and when farming was in deep depression. Thomas Tratman, married in 1870, had a daughter who married Frederick Churchill Humphries, himself a blacksmith. Tratman became Parish Clerk, and then Post Office receiver. He died in 1892 but his widow continued with the post work, becoming a sub-postmistress. During the typhoid outbreak in 1898 Post Office business was transferred temporarily to a house towards Stow Hill (now Patchwork Cottage), but returned to the smithy cottage until 1900 when Humphries, expanding his business of plumbing and decorating, built Liberty House, and transferred the Post Office there. The original Church Cottage had mostly been privately occupied; now the former smithy also became a private dwelling, until in 1944 it was destroyed by fire. Walls remain, to show its former use as a smithy From 1728, the property was owned by the Hardwicke family until 1935 when the last of the line died. At the auction of the estate in 1936, both cottages were bought by Charles Daniels; his daughter Madeline Mary married Reg Smith, who now owns the property and lives in No. 1 with his second wife Millicent. The Smithy was so well rebuilt 60 years after it was destroyed to match Church Cottage that it is difficult to tell which building is the new one! 1830s and '40s Mary Sainsbury, an elderly spinster, whose younger brother farmed `Boyts Farm', and her young nephew Edwards Farm. In 1842 she bought a half-share of the large house 'Bromwich's' up West Street (now Porch House). She died in 1850. 1851-62 Henry Payne, cordwainer (shoemaker). 1863-70 Isaac Fry, retired innkeeper from The Swan, who died in 1870, aged 82. 1870s Edgar J Lashford, butcher. His wife kept a small school, the last in the village before the opening of the Board School in 1876. 1880s Robert Tratman, retired after 30 years as the blacksmith at the smithy next door, and died in 1887. 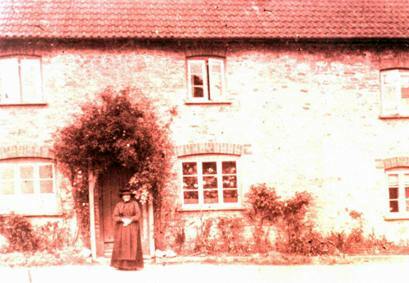 1890s-1918 Mrs Elizabeth (Grannie') Daniels, after 40 years at Yew Tree Farm, which she continued to own until 1904. She was 95 when she died in 1918. 1918-1945 B Trotman, well known as a cricket umpire. After his son had died as a prisoner-of-war, he moved to live in Thornbury with his daughter. 1945 Vincent Reginald Smith, responsible for the floral display. 1840s John Tratman, blacksmith, died 1851. 1850s-70s Robert Tratman, his son, blacksmith. 1880s Thomas Tratman, blacksmith and Post Office Receiver. 1892-1900 Widowed Mrs Elizabeth Tratman, sub-postmistress..
using offal from Boyt Bros., bacon curers in West Street (Verbal, George Pearce). c.1911-1944 Lawford B Blanchard, with a paper round before the Davis's, a bell-ringer. 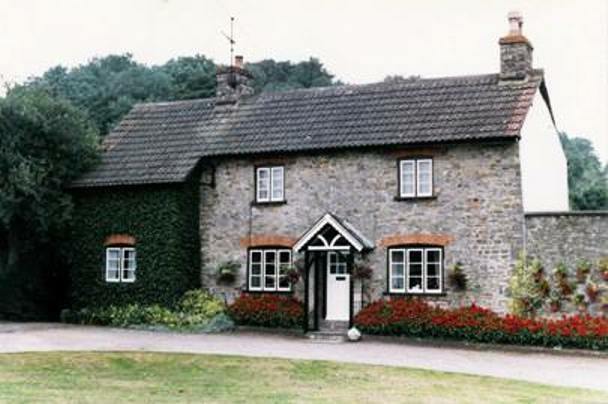 Right: Church Cottage pictured in 1990.